Protection from Evil: This spell hedges the conjurer round with a magic circle to keep out attacks from enchanted monsters. It also serves as an "armor" from various evil attacks, adding a +1 to all saving throws and taking a -1 from hit dice of evil opponents. (Note that this spell is not cumulative in effect with magic armor and rings, although it will continue to keep out enchanted monsters.) Duration: 6 turns. This spell bares some thinking about. First we should note it only protects the conjurer, and not other members of the party. Two, we might note is it creates a magic circle, not a cube, or sphere, so there might be some wiggle room in certain oddball situations, possibly. Something to keep an eye out for if you are a really picayune rules lawyer. Nothing comes to mind off hand though. The size of the circle is not stated, but I think it would be fair to assume that since it only protects the conjurer the circle is fairly small, say 5 feet in diameter. That's an assumption, however, and it is not stated in the rules, so there could be some variance on that. Also note that the rule says it will "keep out attacks from enchanted monsters". This suggests it will keep out ALL attacks, magical or physical of any enchanted monsters (including Dragons? ), but this seems unclear, and possibly a bit unreasonable as it would mean that even the lowliest Magic User could be fully protected from all of the attacks of a Dragon, for example. Somehow, I think not. That at least would put a reasonable bound on this spell, and not make it over powered, but this is an inclusive adjunct power of the spell, and I have to assume that each part stands as fully effective on its own. Hence, it provides complete protection from all attacks of enchanted monsters, and a +1 Saving Throw protection from the above listed evil spells. Additionally, as if that were not enough, this potent little spell also provides physical protection in the event of mano-a-mano combat. How it does that is by weakening evil opponents with a -1 to their Hit Dice. The description doesn't say which evil opponents, if there is a limit to the number of them, or if it means only those evil opponents who engage the conjurer in physical combat. As this rule seems a bit vague to me in certain regards, and so seems open to interpretation, and therefore a good deal of fudging (and mistakes) may be made in regards to its usage, I'm curious to see what others have to say. Google! I summon thee! Prevents "enchanted monsters" from attacking the caster. Other "evil attacks" are at -1 to hit and saves are at +1. Is not cumulative with other magical protection. 6 or 12 turns (for M-Us and clerics, respectively). Thank goodness for Google. That certainly clarified my confusion. Lastly we should note that the magical protection is NOT cumulative with other magical protections, so I imagine if the Magic User is wearing a magical armor that protects against physical attacks (such as bracers), then whichever is the higher protection value is the one that gets used by the GM. All in all, I'd say that this is an essential spell for Magic Users who want to maximize their chance of survival in dangerous fighting conditions, and being a multi-part spell you certainly get a lot of bang for the buck out of it. I rate this spell a 5 Stars for usefulness. Light: a spell to cast light in a circle a 3" in diameter, not equal to full daylight. It lasts for a number of turns equal to a 6 + the number of levels of the user; thus a 7th level Magic-User would cast the spell for 13 turns. I rate this spell a 1 Star for usefulness. Charm Person: This spell applies to all two-legged, generally mammalian figures near or less than man-size, excluding all monsters in the "Undead" class but including Sprites, Pixies, Nixies, Kobolds, Goblins, Orcs, Hobgoblins and Gnolls. 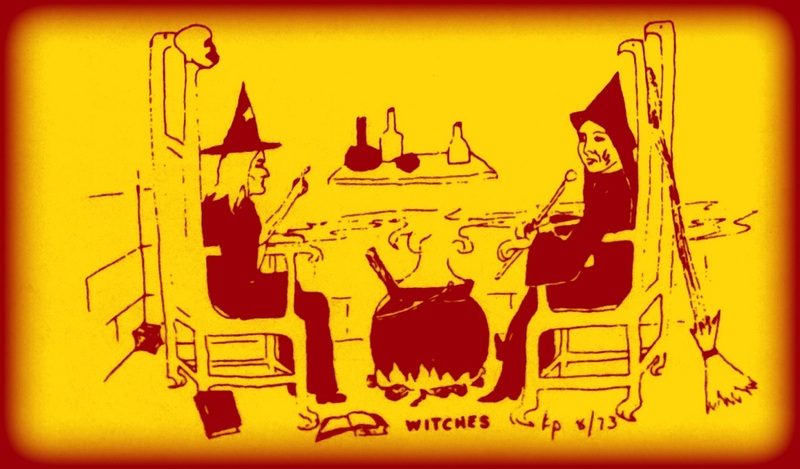 If the spell is sucessful it will cause the charmed entity to come completely under the influence of the Magic-User until such a time as the "charm" is dispelled (Dispel Magic). Range: 12"
Oh snap! Now this is a POWERFUL spell. It basically can turn almost any humanoid foe into a friend (except Undead). Dang! This not only includes having your new friends divulge everything they know about the enemy (which could be quite a lot), but also fight for you, as well as return to home base and burn it down in the middle of the night, or any other damn fool thing they'd never be willing to do otherwise. As Thulsa Doom once pointed out, "Steel is not strong, boy... Charm Person is Stronger... Now THAT is POWER!" The fact that this spell lasts until dispelled makes it unutterably powerful in so far a clever and devious Magic-User with a deft touch could do enormous damage with it. However, there are a few caveats. One, is that it might now work, and the higher the level the creature it is being cast on the less probable it will be to work. So there is that. On the other hand our Very Clever Magic User might not need high level "Friends" to execute a devastating blow on the enemy. A lowly serf with a Wand of Fire Balls put in the right place at the right time could wreck as much devastation on a Kingdom as an invading army. Interesting, isn't it? The other caveat, of course, is the Range. And yet, that range is not all that meager either. 12" (360' according to the Chainmail rules). Daaaang, bro! I don't care what people say about Charm Person - that's a damn POWERFUL spell! In the right hands, under the right circumstances, of course. Sleep: A Sleep spell affects from 2-16 1st level types (Hit dice of up to 1+1), from 2-12 2nd level types (hit dice of up to 2+1), from 1-6 3rd level types, and but 1 4th level type (up to 4+1 hit dice). The spell always affects up to the number of creatures determined by the dice. If more than the number rolled could be affected, ddetermine which "sleep" by random selection. Range: 24". Well, this one is pretty much the only truly offensive combat spell in the lot, and as such it's not half bad, as it can knock out a large number of creatures at once. And after they're on the ground and fast "Asleep" ... one can easily run around and do whatever to them. But the spell is also a bit problematic. The dice spread seems fairly reasonable, if slighly uneven, but I won't quibble about that. 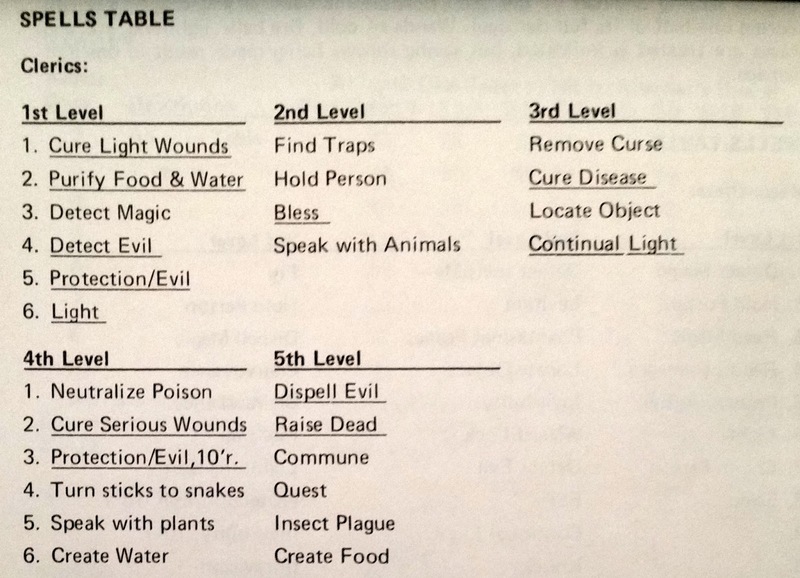 1st Level you roll 2d8, second level 2d6, third level 1d6, and forth level you can only affect 1 creature. Not bad. But the problem is ... how long are they asleep for? The description does not say. On the other hand that Range is awesome. Note that archers in the Chainmail Rules only have a Range of 15, or 18 at the best. This means that your lowly 1st Level Magic User, can stand out of range of archers and render up to 16 first level bad guys asleep per melee. By the time the archers could even get into range (Archers move 9, so it would take 3 turns for them to get into range, assuming the Magic User is not moving) the Lowly 1st level Magic User could take out 48 1st level enemies. On average he could take out between 24 and 36 foes. Ok, ok, ok. That is not bad! And that does it for the 1st Level spells. More to come, so stay tuned. Shameless Promotion Time: If anyone is interested in helping with my very own Elthos RPG Mythos Machine Open Beta please head on over to http://Elthos.com and create a free Beta Account for yourself and check it out. I can use all the feedback I can get. Thanks! The categories, btw, are listed for my convenience and are of my own making. The book does not mention them. When creating the categories I tried to keep to as few as possible in order to keep things as simple as possible. 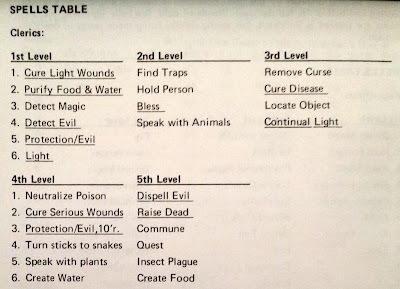 I think they pretty much hold, and you can find the full categories list in my Notes on OD&D - Part 14. Detect Magic: A spell to determine if there has been some enchantment laid on a person, place or thing. It has a limited range and short duration. It is useful, for example, to discover if some item is magical, a door ahs been "held" or "wizard locked", etc. Seems like this spell has the intention to allow parties to locate magic items, which of course could be extremely important to the success of the campaign. We should remember that in the early phase of OD&D, based firmly as it is on Chainmail, it is primarily a wargame with fantasy elements, and there are factions (armies), and in the end one side or the other (Good or Evil) is going to win. In this context magic items may have served like a variable form of artillery for a faction, giving it a greater chance of victory in the larger scheme of things by empowering heroes. These heroes, being associated to one or the other faction (or neutral which means they might side with either faction under some circumstances) special capabilities and powers. 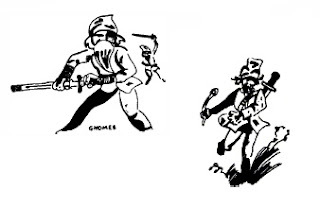 As always, I must caveat this with the understanding that I have no particular experience myself with the playing of OD&D, as in the days of yore I played mostly with GMs who created their own homebrew rules systems and worlds. I did, however play OD&D a few times, and even in those cases it was already a later variant, and did not make that much use of the chainmail rules. It was a very rough and tumble game, though, and survival was not to be expected. None of my characters in those games survived, at any rate. Aside from the locating of magic items (or identification thereof) the secondary use of this spell would have been to determine if doors were magically sealed, or if in fact any object or person or thing was magically enchanted. One might use it to determine if a person was under a charm spell, for example, and that might come in very handy in some cases where an infiltrator had entered the ranks under a charm, or if a party member had been captured by one - either case being potentially disastrous. This seems like a very handy spell, actually. One might note, though that there is no rules on how long it lasts or what the "limited" range actually is. 10'? 1 hour? 3'? 4 hours? No clue. This would leave things up to the GM to decide, and I imagine that this might have lead to more than a few arguments or disappointments over time. I think I'd be more comfortable as a player knowing the exact limitations. I rate this spell 5 Stars (out of 5) for usefulness. Hold Portal: A spell to hold a door, gate or the like. It is similar to a locking spell (see below) but is not permanent. Roll two dice to determine the duration of the spell in turns. Dispel Magic (see below) will immediately negate it, a strong anti-magical creature will shatter it and a Knock (see below) will open it. This first level spell seems useful if your characters are being chased by the bad guys and you need a bit of extra time to escape. Or you listen at a door and don't like the sound on the other side, it could inhibit those on the inside from breaking into your party while you beat a hasty retreat. Kind of useful under some circumstances (but not really that many, at least that I can think of). Read Magic: The means by which the incantations on an item or scroll are read. Without such a spell or similar device magic is unintelligible to to even a Magic User. The spell is of short duration (one or two readings being the usual limit). This one is a bit confusing to me. I'm not sure what the significance of the duration is, or why there could be more than one "reading" per spell. At any rate, this is obviously an important spell as without it Magic Users can not use items or scrolls... I think. I'm not quite sure how to interpret it's use from this description, frankly. Looking around briefly on the web I notice that other people have also wound up interpreting this rule in two different ways. Some think that it reads "Without such a spell, or similar device, magic is unintelligible...", while others say it reads "Without such, a spell or similar device-magic is unintelligible...". The difference being that in the first case the Read Magic spell (or similar device) allows one to read magic, while in the second case it means that the Read Magic spell allows one to "read" "device-magic" (ie - magic items, or magical devices), or in other words perform an "Identify Magic" function. There's been some debate about this. In either case, the spell is clearly important and necessary for the full functioning of Magic Users (ie - without it one can not "read" (I assume this means "use") magic items such as scrolls, and other magical script based devices. Read Languages: The means by which directions and the like are read, particularly on treasure maps. It is otherwise like the read Magic spell above. The key hint here is that this spell is used to interpret maps, and one assumes that without it one has little chance of being able to read maps effectively. Maps, undoubtedly, are their own form of valuable-as-heck treasure as they often point to other treasures, and more often than not, we may expect other magic items as well. They also may reveal secret passages, traps, and whatnot. Obviously this would be exceedingly helpful when finding maps. The question is, how often does one find maps? Ok, that's enough for today. I will pick up where I left off next time. Another step forward on my journey through Men & Magic... an ongoing study of the Original D&D rules books, because ... well, I finally got around to it, and it's really pretty interesting! First thing to notice is that there are some Cleric "Spells" (should they really be called that?) which have the same names as their Magical compatriots. Interesting. I wonder if they will prove to be any different in character or not. Also note that there are far fewer Clerical Spells than Magic User Spells. But of course Clerics are also Fighters, whereas Magic Users are not (unless they are Elven). The total number of Clerical Spells is 26 as compared with 70 Magic User Spells. The Yellow Highlighted Cleric Spells are those that are shared with Magic Users. Obviously the tenor of the Cleric Spells are, for Good Clerics, non-combat oriented, while for Evil Clerics there is a good deal of harm they can do with their Harming Spells. And whether Good or Evil, Insect Plague sounds like something that would be rather unpleasant I should say. I will circle back around on this Spell list when the book gets back to them. At the moment all we get on p22 is the raw list. 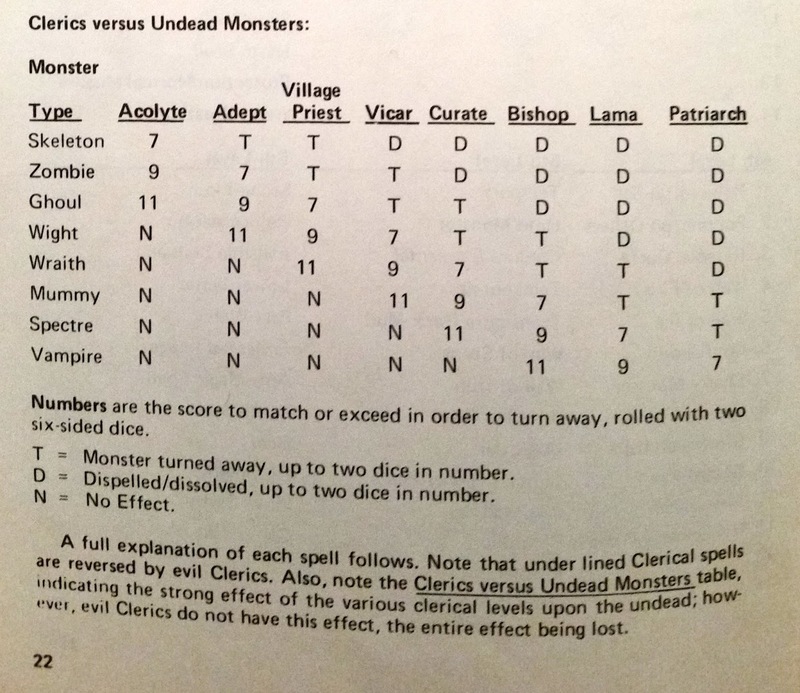 This chart lists the various kinds of Undead and how the various Levels of Cleric are able to handle them. 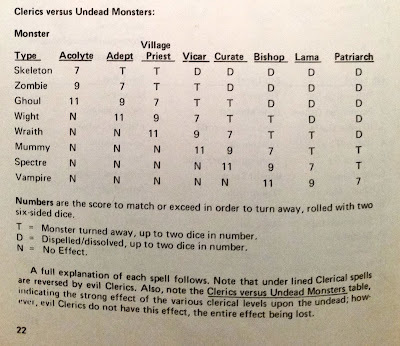 Note that this chart is entirely useless for Evil Clerics, the "entire effect being lost", and so Evil Clerics, regardless of the circumstances can not turn, or dispel Undead. I would imagine based on this, that it is not unlikely that the Evil might come to regret their choice of Alignment one day, somehow. Just a guess. Well as there is not much I can think of to say further on this page, I will leave it at that. 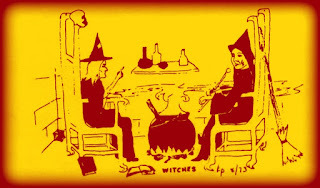 The interesting stuff will come next time as I analyse the Spells lists, and compare the Magic User and Clerical Spells. I'm particularly interested to see how the overlapping Spells compare. It's been a hectic week, to be sure. But here I am, ready to forge ahead again with my study, analysis and ruminations on OD&D. Today I tackle Men & Magic p. 21 - the Spells Table. Not much to say on this, and I don't think it's a worthy use of time to type out the table. An image will do. We a list of a variety of different kinds of Spells for Magic Users, ranging from first Level Spells to sixth. The maximum number of spells for any level is 14, and there are a total of 70 spells. At first Level the only offensive spell is Sleep, which does not damage the target. At second Level we also have scarcely any offensive spells except, perhaps, for Phantasmal Forces. At third Level we get our first combat magic in the form of Fireball and Lightning Bolt. At fourth Level we have no offensive combat magic per say, though some of the spells could be used to help in combat (such as confusion, and Walls of Fire and Ice). 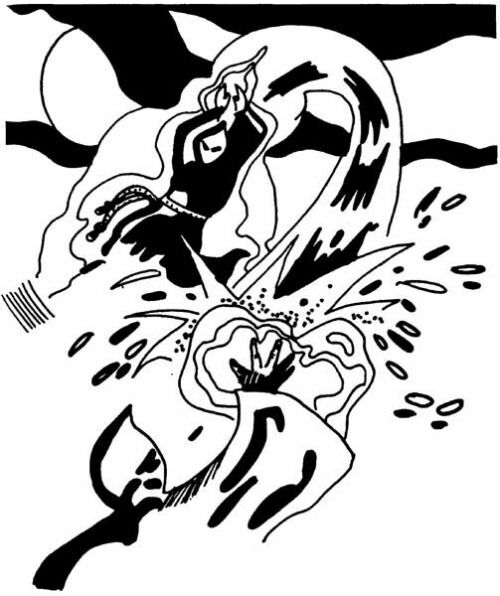 At fifth Level we have Cloud Kill, which is the only combat magic in the list. At sixth Level we have Death Spell which certainly is intended be used in combat, along with Disintegrate. In total out of 70 Spells listed the Magic User can obtain a total of 7 combat spells. Or rather spells specifically designed for use in combat (though some of them may be used for other purposes as well, such as Phantasmal Forces). Well folks, that ain't a lot of combat magic for the Magic Users. The other spells range in effects and cover such things as detection of various sorts, protections of various kinds, transportation, mind control, transmute persons or the terrain in various ways, as well as a summoning spell. As we can see from the list, the lion's share of the spells are Transmutations and Mind Control. I think this is interesting as it lends itself to a stylistic concept of magic as not being necessarily combat oriented. Why should this be surprising? Because the emphasis of OD&D appears to be on Battle Maps and combat. I have to wonder, based on this spread of magic if that impression is entirely accurate. It may be that the game as played was not really as focused on combat as I might have imagined. I'm wondering if, in it's own way, back in the day, it was pretty much the same kind of story-oriented game as I play today, but with the simple distinction that the combats, when they occurred, would follow the Chaimail style of combat, with a focus on tactics and miniatures ... but that those combats were not necessarily every game and all game long. Interesting indeed. Ok well that's it for today. I'm so very busy lately. What with trying to get my system finalized and such. 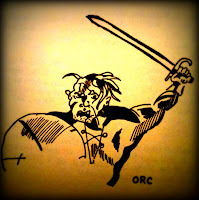 But still OD&D is so fascinating I can't help but want to complete my course of study/analysis and commentary. I hope you are finding this of interest as well. p20 - 21 ... Saving Throw Matrix. The Classes are mixed in by level so it makes it a little hard to read. Here's a picture of the chart. "Failure to make the total indicated above results in the weapon having full effect, i.e. you are turned to stone, take full damage from dragon's breath, etc. Scoring the total indicated above (or scoring higher) means the wpaon has no effect (death ray, polymorph, paralyzation, stone, or spell) or one-half effect (poison scoring one-half of the total possible hit damage and dragon's breath scoring one half- of it's full damage). Wands of cold, fire balls, lightning, etc, and staves are treated as indicated, but saving throws being made result in one-half damage"
I had to tie the programmer in me up and put him in a closet for the next section. Dr. McCoy has given him a hypo-sedative and Mr. Spock is standing by with a nerve pinch in case he tries to escape. He's gone full loco on this one. At any rate, lets take a look at the Saving Throw Matrix. First thing to notice is that this is a bit of a sloppy chart. My usual quibbles come to mind immediately. Foremost, the structure of the thing is kind of horrid as it mixes both Level Groupings and Classes in a way that makes the chart hard to read, though I can understand the logic of why they did so; save space. If they broke it out logically (as I will do shortly) then it would be three charts, not one. And the Level Groupings would be easier to distinguish. With the chart as it is, I can imagine that there's been many a time where the GM thought their eye scanned the correct line, but didn't, and the numbers were off. Since the Referees roll (according to the rules in this book) and not the players, the players would of course never be the wiser. Yet with a chart like this the chances of making mistakes is unusually high. That said, it does achieve the goal of saving space, and so I think we can forgive the fledgling TSR on their wish to save some money on printing costs by making charts as tight as possible. Sort of. I guess. Maybe. Hmmm... obviously, I'm really not so sure about that. I notice that the chart uses "Fighting-Men" only once, and then changes to "Fighters" which is the first time in the book that term is applied, so I now feel comfortable referring to Fighters going forward. Lets take a closer look at the spreads. Once again we have entered the Erratic Zone. To make the analysis a little easier I once again translated the chart into Excel, and broke it down into a more detailed form so that it can be analyzed properly. Not that there's that much here to analyze really, but it might turn up something of interest to do so, that might not be noticeable at first glance, especially given the rather horrid structure of the chart (yes, that the programmer in me shrieking from the closet, but try not to let him bother you). You will notice that I split the chart into one for each class, and delineating the Levels, and also included at the bottom the differences between the Saving Throw values for each level grouping below each chart. It's a bit hard to tell, but looking at the bottom set of charts you can see that in some cases the difference is 2, in some cases 3, in one case there's a 4, and in one case there's a 5. I won't go through the usual pet peeve I have about this kind of erratic number jumping as I already covered that in previous posts. The programmer in the closet will just say "Yuck!" and we'll move on. I might go on to also suggest my theory that not every GM who has used OD&D has necessarily noticed the number jumping, and I think this would be likely if they simply used the chart to do the fast look ups and never really scrutinized the chart carefully for variations in point spreads. When you look at the chart as it is presented in the book it is not readily clear that the points spreads jump around the way they do. This, again, has to do with the fact that the structure of the chart makes it a little hard to read. Lets take a look at the graphs that show the differences. So what we can see here is the spread is erratic. We know that. But what does this information tell us about how Gygax and Arenson conceived of the Saving Throws? 1. The three classes are very distinct from one another in terms of Saving Throws. 2. Fighters usually advance 2 points for every level and against every type of attack, except for Stoning and Dragon's breath. 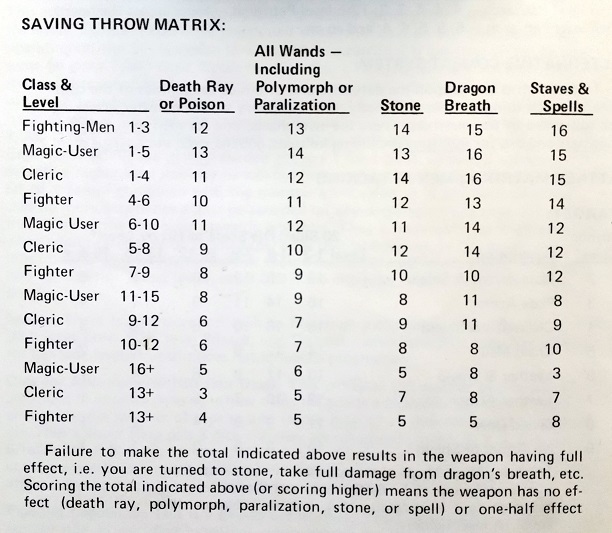 This suggests that for Fighters stoning and dragon's breath are a bit easier for them to defend against than the other types of powers, though to be honest, in that case I'm rather surprised that Death Ray and Poisons didn't make the grade for that distinction. I wonder why? I would think that Fighters would have a better chance being heartier with higher hit points and a better constitution ... in particular vs poisons. Hmmm... ok. Maybe it was arbitrary. Or maybe I simply don't quite understand the logic behind the distinction. That's the more likely explanation, frankly. 3. Magic Users get a really big boost vs Staves and Spells. Well, that makes sense. Against everything else its pretty much even across the board. 4. Clerics are a bit more jumpy, but it looks like at certain levels they get advantages over Fighters, but Magic Users still trump them. So Clerics are in between Fighters and Magic-Users, except that Fighter get their bumps at different levels than Clerics. 5. The bumps for Fighters and Clerics seem distributed between the levels randomly, sometimes being in the second levels grouping, sometimes in the third or fourth. Magic-Users seem to have a steadier bump pattern at least, where the biggest bumps are at the highest levels. To my mind that actually makes the most sense. If I were going to redesign these charts to make them conform a little bit more to my ascetic sense I would try to pack the larger jumps into the higher levels. But again, as I mentioned before, the purpose of these jumps may be simply to give the players something to say "Oh Yeah!" about at certain levels. Ok, that's probably good for today. We've managed to advance to page 21, but the next section is the spells list, and that's probably going to be something I want to discuss at length. Maybe. We'll see. I'd like to take a quick look again at what we just covered in Part 11 because I think it's often a good thing to get out the old microscope and see what devils are hiding in the details. Don't you? So lets take a peek under the hood. Looking at the Men vs Men Attack Matrix I think we should notice, perhaps not instantly, but after a few moments of staring, that there is yet another odd and inexplicable (for me), and slightly obscure, jumping around in the numbers involved here. Here's the Chart broken down with a slightly higher level of detail (which in and of itself revealed nothing anomalous in the spread of levels, in other words each levels set is even at 3 levels without variance). Nothing to see here, ... except ... hmmm... what's this? Lets look at the spread of the values between the levels grouping for second. The lines look even, but I notice there is a slight variance in there. Lets try from another angle. Aha! There it is. Quite clear now. The differences jump. Between 1-3 and 4-6 the difference is 2. But between 4-6 and 7-9 it's 3. Then it goes back to 2 for the next two level groups, and then returns to 3 for the last set. Whyyyy? Why they do that to me? I don't know. Why not keep it even? An even jump for all levels of either 2 or 3? Well for one thing, since they wanted to go from 17 to 5, and that value doesn't iron out evenly, it may be simply that this was the best fit for the spread they wanted. And yes, it's a bit erratic, but gets the spread they wanted. But why that spread? Why not go from 17 to 4? Or 18 to 5? Or something like that in order to get the spread even so there's no jumping between the level groups? I don't know. I'm curious enough to toy around with this and see what happens. Hold on. This is what the chart would look like if they had chosen an even spread, starting at 18 and going to 3. Obviously at the lower end where the negative values start coming into play probably presented the designers with a problem. (Note that all values below 1 get converted to 1 in the actual chart). So instead of having 1 starting at Chain & Shield, we would find 1 starting at Leather & Shield. 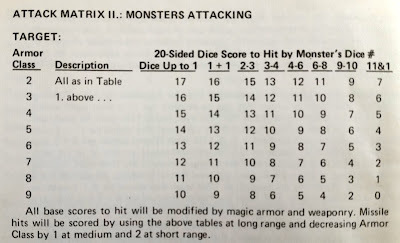 This was probably simply unacceptable to Gygax and Arneson on the grounds that the game would then become too lopsided with a tendency to eliminate the distinctions required between the lower armor classes when encountering higher level attackers. In other words it means that 11th Level Fighting-Men would always hit when encountering opponents in no armor. 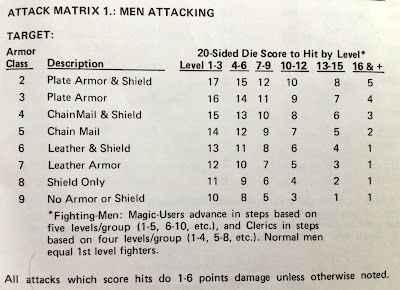 In the original chart, however, 11th Level Fighting-Men need a 3 or better to hit the same non-armored character. I"m not sure how vastly different the game would play out were they to have used this chart instead of the original, but I'm wondering if it wouldn't have made that great a difference in the game. And if not, I would have preferred, once again, a smooth and even progression, rather than a jagged one. But, as I've noticed along the way, jagged edges in the numbers seems to be part and parcel of the OD&D rules. Why? Maybe they just liked jagged lines. That could very well be, and I'm going to suggest that we not fault them for it. While not mathematically balanced, it may very well be that the jagged lines created satisfying bumps and valleys in the numerics of the game, and that the players liked when they got a bump, disliked when they hit a valley, and this feature was something of a delight for Gygax and Arneson as it created more emotional content related to the mechanics. "Woah, yeah! This level I get a bump of 3! Sweeet!" On the other hand, putting on my programmer's hat again, I'm going to come out and say it. BLEH. I don't like the hills and the vales in the numerics of the game. It makes everything ad hoc, and so you can't create a formula to generate the charts. You have to create tables in the database and manually enter the values. Yuck. Yuck. Yuck. Don't like. But that's the programmer in me talking. Feel free to ignore him. Ok so now I want to take a quick look at the Monsters Attacking chart. And this is where they really make the programmer in me cry. Wahhhh. Okaaaay. That was weird. But lets ignore it! Hah! Why? Because I don't get it. I'm obviously missing something. Clearly I don't know how this chart gets used. And so I can't understand why the numbers are staggering. If I had to use these rules out of the box without help, at this point I would be stuck. I would simply tell my players, "Ok when the monsters come, the universe is going to get very confused while you fight them. Sometimes it will think they are hitting you at one level, sometimes at the next level, except at certain levels where then the universe will be sure of itself again. Ok? Great. Here come the trolls. Good luck." And again that whiny programmer in me is all like "omg omg omg" and stuff. Lets ignore him. He can go sit with Mr. Spock and they can shake their heads in dismay together over there. Before I finish, though, I want to look at the spreads and see what that pans out to be as well. I'm going to guess there will be something like the same anomalies as we found in the Men Attacking Chart, but as you know, I like to pick at this stuff with a fine tooth microscope, just to be absolutely sure. 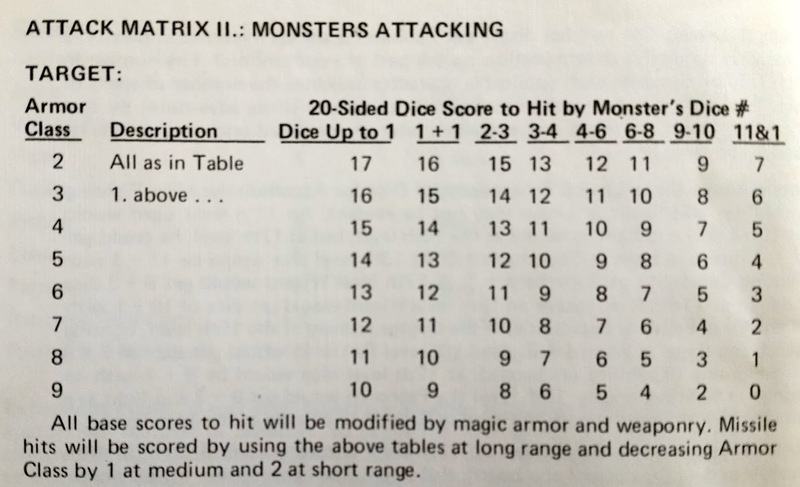 Another (programmer) insanity inducing thing about the Monster Attacking chart is that the spreads are not even either. Sometimes the spread is 1 level, sometimes 2 levels, and other times 3 levels. The programmer in me ran off shrieking, so we don't have to worry about him for the moment. Lets take a look at the charts. Ok so there we have it. The anomalous patterns, as predicted. It's ok. I'm used to it now. And there may well be good game-reasons for it. Programmer-me has stopped shrieking and is over in the corner sulking, but I sent Dr. McCoy with Spock to help the poor guy out. He'll be fine. But I suspect he won't take the job of programming this system for anything less than 200k / year with plenty of benefits and lots of vacation time (to de-stress). Alrighty then, I think that covers it for today. So far so good. I'm gaining a much better understanding of OD&D, and I do hope this is helping others to do so as well. A lot of you who are reading this, of course, already know OD&D backwards and forwards and much better than I do, so please continue to pipe in with your corrections and comments. It's very helpful to me. Thanks! 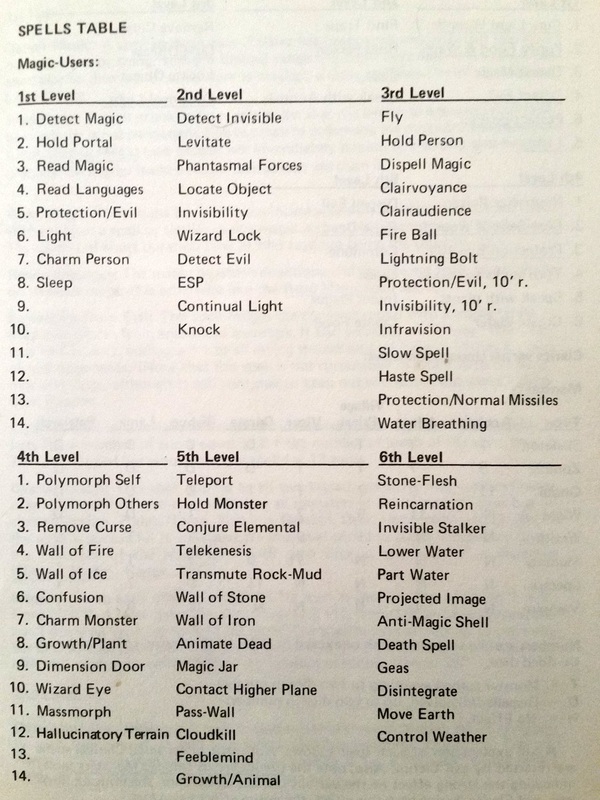 The chart column indicates the number of spells at each level that the magic-user or cleric can be used (rembered during any single adventure). Spells used once may not be used again the same day. Note: If I don't miss my guess Vancian Magic starts here. The definition being as follows: "A form of magic based on the existence of spells that must be prepared in advance, for specific purposes, and that can be used a finite number of times." (reference https://en.wiktionary.org/wiki/Vancian_magic). This concept of magic is, to the best of my knowledge, quite arbitrary, and has lead over the years to quite a few conundrums. I'm not that well versed in the topic, however, so will leave the debate to others. I will simply comment that I never really was especially fond of the Vancian modality for RPG Mystical types. Why the Vancian system was chosen for OD&D may simply be a matter of Gygax and Arneson liking Jack Vance's novels. As a game mechanic, I always found it a bit stultifying. "Progressions of Dice of Accumulative Hits, Fighting Capability, and Spells & Levels may not be evident. An 11th Level Lord would get 10+3 dice and fight as he did at the 10th level; but at 12th level, he could get 11 + 1 dice and fight at Super Hero + 2. At 13th level dice would be 11 + 3 with Fighting Capability at Super Hero + 2. A 17th level Wizard would get 9 + 3 dice no change in fighting Capabilities - the change coming at the 19th level, fighting then being done at + 3. An 11th level Patriarch would get dice of 7 + 3 with Fighting Capability unchanged; at 12 level dice would be 8 + 1 with no change in fighting; and at 13th level the Patriarch would get 8 + 2 and fight as a Super Hero - the next change in Fighting Capability coming at 17th level." Spell progression is then covered. in similar fashion. Note: This will require me some time to digest. I may want to do a bit of analysis on this to see if I can tweeze out whatever the guiding principal of this rule is. I'm sure (well, not I"m not at all sure) that there is a pattern here that could be described in a way so as to make sense of how to figure this out. Or it's totally arbitrary. Not sure at the moment, but it looks arbitrary to me at first glance. The alternate system is based on the relative combat capabilities of the combatants (offensive and defensive); such things as speed, ferocity, and weaponry are subsumed into the matrixes. There are two charts, one for men vs men or monsters, and one for monsters vs men. Note that the objective here is to roll above the number listed. So accordingly, Plate armor and a shield are bulky as heck and it's harder to hit things when you're wielding all of that. No armor or shield, on the other hand, gives a significant advantage in terms of ability to strike the opponents. Interesting. Monsters work the same way. Notice that Armor Classes are listed as low = the most armor, with 9 being the least. I'd have done it the opposite way and make 0 AC no armor so that I could always add higher armor classes later if I felt the need without having to drop to negative numbers (tank armor for example would be something like -10 in the current system). But at any rate seems reasonably straight forward in terms of a look up chart. My beef with it is essentially that it's simply not well rationalized. I'd hate, for example, to have to program this system because it's so picayune and difficult. Also note, oddly, that the AC 9 vs 11&1 (whatever that means) is 0. You can't roll a zero, I don't think. So in effect it means "always hits", which in effect is the same thing as the 1. What's odd is that the top chart shows 1's whereas the bottom chart includes the 0. No idea why. Typo, maybe. Ok that's probably enough for today. I need to sit down and look this over some. It's a bit convoluted so I'm not sure what kind of analysis to do on it. I'll just leave off with the observation that it's both complicated and simple at the same time. The mechanisms of play, in other words, are simple enough - you look up something on a chart and get the number to roll above. The convoluted part has to do with the numeric progressions and unevenness of the math. For example, did you notice that on the Men vs Men chart the 10-12 column starts at 10 instead of 11? Why did they skip 11? Hmmm... unevenness just bothers me. I'm too much of a programmer to feel comfortable with that kind of thing, I guess. Ah well, I'll just go over and sit with Mr. Spock in the corner and commiserate for a while. "It seems highly illogical". "Indeed, it does." "Plate and shield are harder to hit ... a 3rd level fighter needs a 17 or higher to hit an opponent in plate with shield, but only needs a 12 to hit a target in leather armor﻿"
"The more armor the target is wearing, the higher you need to roll... not because you are encumbered, but because they are a harder target. Off of those charts, there's no stated penalty or bonus to your attack roll when armored, only a target you need to meet or exceed.﻿"
So yes, I really had the wrong interpretation of this chart. The way you should read it is "If my Character is X Level, this is what he needs to roll above in order to hit Armor Class X". I kinda had it backwards there. Thanks guys for clarifying how the chart works!